Constantly have to update "Freedesktop.org Application . 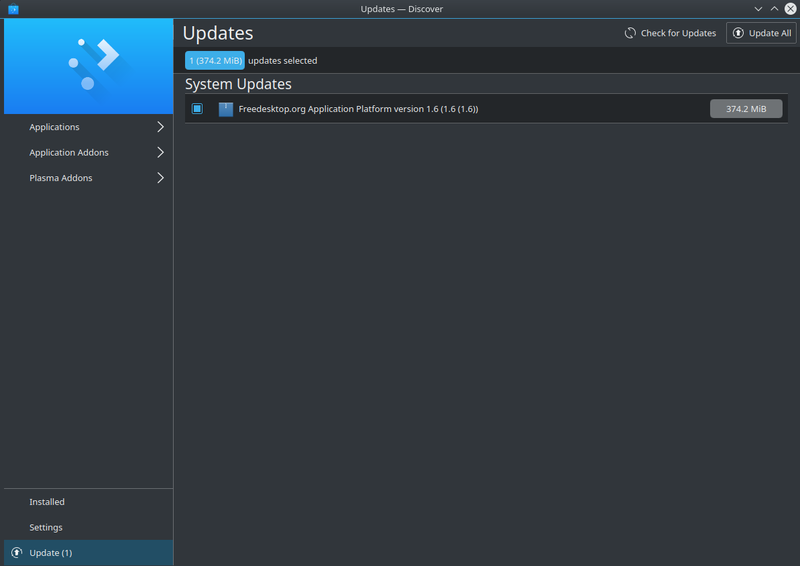 . .
No matter how many times I select "Update All", it does nothing and just keeps showing me this. If I do a sudo apt update and a sudo apt dist-upgrade I have zero packages to upgrade. This is a fresh install from about 2 hours ago. Re: Constantly have to update "Freedesktop.org Application . That is a flatpak runtime, not a debian/.deb package that can be managed by apt. I'm relatively new to these new-fangled ways of managing packages, what is the process for updating it? Also, it is pretty cool that Discover can keep track of flatpack updates, does it do that for snaps as well? I'm guessing that the eventual plan is to have all of these updatable within Discover, is there an ETA on that? EDIT: I'm guessing based on the updates available this morning that yes, it does seem to do something in regards to snaps.